Entrepreneurs like to attack huge markets where the customers hate the incumbents. The $2.8 trillion US H­­­ealthcare market fits the bill on size. Re hating the incumbents, ask consumers to name one entity that they hate the most and many will skip Banks and Telcos and zero in on their Health Insurance company; look at Net Promoter Scores for some quantitative data. Being denied coverage when you or a loved one face a life threatening illness is as stressful as it gets. The hairball complexity of the claims process leaves plenty of room for Health Insurance to deny coverage; enraged customers call it the “cost avoidance industry” that makes money by denying coverage for some ingenious reason. Today’s Research Note looks at one startup that is trying to do something about this – Oscar. I spotted them in the wild during a recent visit to New York, when their ads were plastered all over the subways. You need deep pockets to go after massive markets with entrenched incumbents. Tick in the box for Oscar, which has raised $327.5m. You also need to be grown up & regulated. Two weeks ago our InsurTech research note focused on the execution problems of Zenefits. Since then, more news has surfaced via excellent journalism at Buzzfeed by William Walden who describes a sales culture run amok. I stick with our original analysis that Zenefits will emerge strong after correcting the execution missteps. Creating a sales management process that is hard-charging without getting caught in compliance and reputational risk is what grown-up companies do. If Zenefits cannot fix the execution issues, some other entrepreneur will copy the business model and execute properly. The opportunity remains huge. Buried in the news is the fact that Zenefits primarily makes money on health insurance. That makes sense because health insurance is not just massive; its hairball complexity is ideal for entrepreneurs who can innovate on the Customer Experience (CX). Last week we looked at another high ambition InsurTech venture – Lemonade. They have not yet announced which Insurance sectors they will target. It is possible that they too will tackle the hairball complexity of US Health Insurance. It does seem clear that Lemonade plans to be an Insurance company and not just a Robo Broker (which is how I would categorize Zenefits). So it looks like Oscar and Lemonade are more comparable. As Lemonade is still in stealth mode, we look at what Oscar is doing as they are already out in the market. Health Insurance is consolidating through massive deals (Anthem + Cigna, Aetna + Humana, Centene + Health Net). The question is whether size is an advantage or a disadvantage. Size is clearly an advantage against a traditional competitor – imagine the crushing sound when a Sumo wrestler lands on a normal sized person. However, disrupters aim to change the rules of the game – for example, that small guy can beat the sumo wrestler if speed is the goal. To change the rules in a huge market like health insurance, new entrants need the magic combo of new technology plus a regulatory change. We look at Oscar in that light below. Incumbents can copy a new mobile experience and hip ads in a heartbeat. Oscar cannot rely on those for competitive advantage. Nor can Oscar compete on price/terms unless they also change the cost fundamentals. Incumbents will simply drop their prices until Oscar are forced out of business; even deep pocketed investors will soon give up that fight. The need to make an appointment face to face to get advice. That is a double whammy on costs – direct costs for deductibles plus indirect via time off work and travel costs. That is the “use our app to talk to a doctor” part of the proposition. The need to make an appointment face to face to get a prescription. This is cost driver they are pitching with their “get prescriptions without ever leaving home”. Some of this is generational. Some articles write about “hipster” health insurance, which is code for younger. It makes it sound as if consumers are being enticed by something fashionable and cool (“wow, mobile interface, cool dude”), but it is much more practical than that. Older generations may have “Cadillac” health insurance schemes from a lifetime employed by a Fortune 500 or by Government. They don’t worry about deductibles. For the many who are retired, they don’t worry about the time to visit a doctor. That kind of healthcare experience is only a historical story for younger people buying health insurance today. Customers buy health insurance but they consume healthcare. It is reasonable to review Oscar as a health insurance company because that is where consumers are being given a choice. However what really matters is how consumers consume healthcare. That is what can change costs and change the competitive landscape. Digitization of healthcare is a 21st century megatrend. In the near term, digitization of healthcare will enable easier access to experts and personalized data will make those experts more effective. That is near term innovation – the technology is already in the market. Longer term, the digitization of healthcare will impact how drugs are created (personalized medicine), how diagnosis is performed (telemedicine), how surgery is performed and new forms of therapy based on genomic data and quantified self data from wearables. Those are powerful innovation tail winds. This gave an advantage to large companies, which had negotiating leverage with health insurance companies. Some large companies took this to a logical extreme by self-insuring, basically replacing the health insurance company. This leaves the employees of small businesses needing a cost effective solution. This is where Oscar could score. One of the big themes we track on Daily Fintech is the use of technology to level the playing field between BigCo and SmallCo. Access to finance is a huge part of that, which is what Jessica Ellerm is covering every Wednesday. Access to cost effective Health Insurance is a key part of that level playing field. 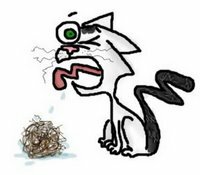 Giant hairball is the name we give to old legacy systems where new modules get layered on top of old code that nobody dares to touch. This was the insult that Scott McNealey of Sun hurled at Microsoft. If you own a giant hairball of legacy code, you tend to have two choices – refactor or rewrite. Given that a rewrite is so high risk, most IT departments choose to refactor (gradually fix one part at a time). Of course, US Healthcare is not owned by a single company, so fixing it tends to become a political decision. Which brings us to political risk & opportunity. 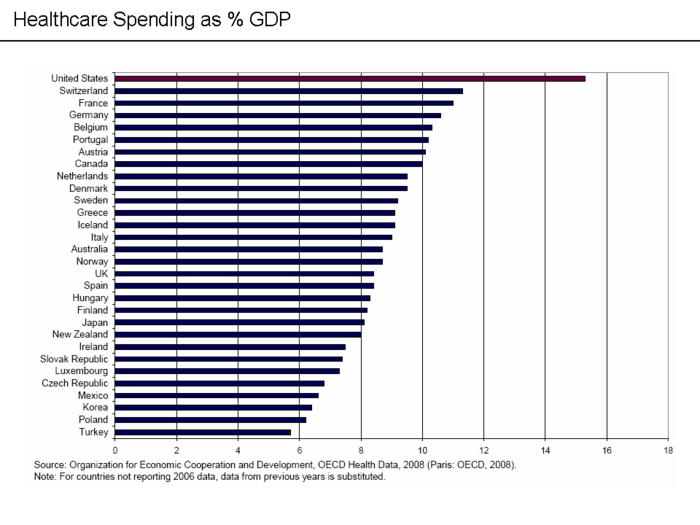 US Healthcare costs are far higher than in other countries as a % of GDP. # 1. Universal Healthcare aka single payer aka Medicare for all which gives one entity the negotiating leverage to drive down prices. This is what many European countries have and what Bernie Sanders is proposing. # 2. Enable consumers to buy health insurance nationally. Today you have to be licensed state by state. That would increase competition, within which digital InsurTech innovators such as Oscar could thrive. It could also move Insurance companies to States with the most lax protection for customers, Today Oscar is only available in New York, but their model could clearly be applied nationally. Donald Trump seems to favor this approach; the lead investor in Oscar is Jared Kushner’s brother. # 3. License more people to provide healthcare services. Doctors in America have a very effective union called the American Medical Association who control the supply of doctors and thus keep prices high. Getting the balance right is tough – people need motivation for those long expensive college years and consumers need protection from incompetence and charlatans. For a non-political and analytical view of the whole American healthcare system, it is hard to beat the Drucker Institute. Oscar is going into a tough market with tough incumbents. It will be a tough fight, but the prize is a big one. 1) Health insurance providers discount prices for high volume insurers significantly, and breaking into this market means you will always have cost headwinds to contend with. 2) Brokers and heavy claimers treat new entrants as a cash cow, using improved underwriting terms intended to drive business to get insurance cover, with a sting in the tail in future years when their claims emerge. 3) Health insurers are incredibly complex to set up initially, requiring many different disciplines (marketing, actuarial, underwriting, medical claims managers) that often struggle to operate effectively together. For example, while the underwriters and actuaries might expect tight claims management in their pricing, the medical staff feel they have a duty of care to clients and have a far lighter touch, while marketing and sales ask for looser pricing and underwriting terms to break in. It can take many years (10 years in our case) to provide a return to shareholders. 1) Younger policyholders are more profitable than older ones due to pricing restrictions (regulatory or marketing) commonly imposed for older customers. New entrants attract a higher proportion of young customers than incumbents. 2) The durational claims effect for health insurance is very pronounced. This means that in the initial years of the policy, claims ratios are better, but they deteriorate over time as underwriting benefits wear off and anti-selection by sicker customer (who are more “sticky”) takes effect. These early claims benefit give succour to new entrants, but also create a mirage of profitability that leads to complacency, resulting in future unexpected recalibrations of pricing and underwriting that can sometimes destroy the business. The success of these new Fintech insurers should be measured in 10 years time, when all these effects have worked their way through the system, and a stable business, underwriting and pricing model has been established. I think the Fintech companies most likely to succeed in the health insurance space will be the brokers. They get to use all the new technology without the restrictions of regulatory capital and operational complexity, and are agnostic to which insurers they deal with. New insurer entrants will offer them a better deal to get in, while the incumbents will offer better deals to protect their market share.